UK boxing fans will now be able to watch exclusive fights live and on demand from their smartphone and tablet with the launch of a new streaming app from BoxNation, Britain’s first and only dedicated boxing channel. The launch follows a number of positive user reviews since a ‘soft launch’ on Apple and Android at the beginning of May. Subscribers to the app, which was designed and built by multi-platform live streaming and catch-up TV service provider SimpleStream, can now stream all BoxNation fights live and on demand to their Apple and Android phones and tablets, along with exclusive access to interviews and a premium back catalogue of fights from the previous three months. They are also able to set reminders so that they never miss a fight again. 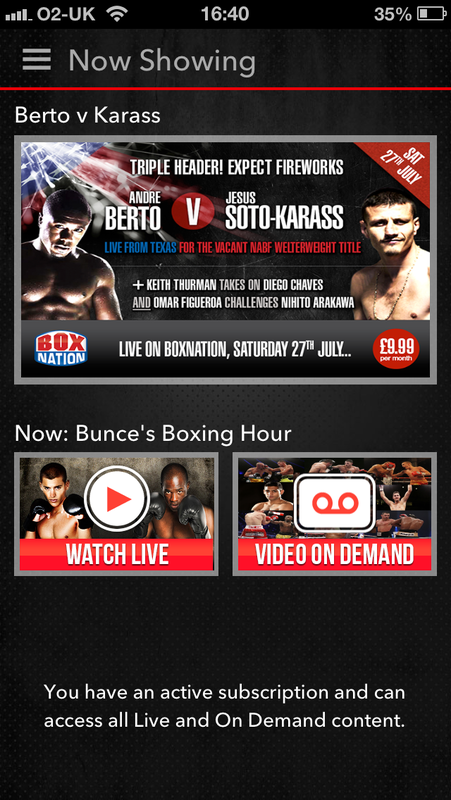 The BoxNation apps use SimpleStream’s proprietary CatchupTV technology. Fans benefit from being able to re-watch recently-aired fights with minimal delay. Videos are delivered using multi bitrate streaming, optimised for mobile and tablet screen sizes. The apps are fully-compliant with Apple’s AirPlay protocol and can be used to watch BoxNation from anywhere in the UK and Ireland using 3G, 4G or Wi-Fi. Dan Finch, Director of SimpleStream, said that BoxNation’s audience would not only be able to watch live fights, but also access a huge video library not available on any of the other platforms. The BoxNation app is available for £9.99 per month, ready to download from the Google Play store for Android users and the Apple Store for iPhone/iPad.